The Balfour Declaration was approved at the Imperial Conference of 1926. Named after the conference chair, Lord Balfour, it stated formally what was already in practice - that the Dominions of the British Empire were autonomousautonomy: self-government; independence. and equal in stature with each other and with England. 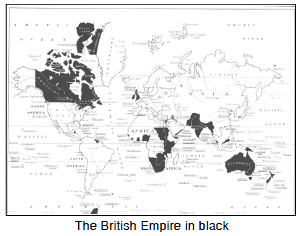 A new association was created that was called the British Commonwealth of Nations. The members of the Commonwealth were "in no way subordinate one to another in any aspect of their domestic or external affairs, though united in a common allegiance to the Crown." 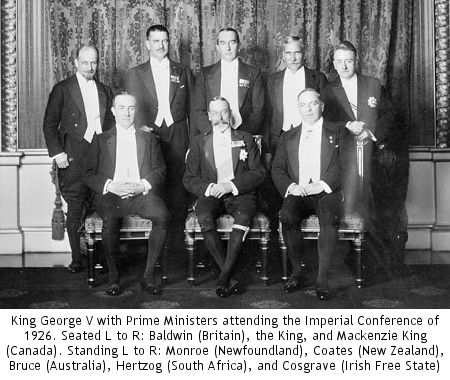 The Canadian Prime Minister at the time, Mackenzie King, led this initiative, along with South African Prime Minister J.B.M. Hertzog. The notions expressed in the Balfour Declaration were made law by the Statute of Westminster passed on December 11, 1931. This allowed legislative independence in the former Dominions except where the Dominions themselves chose not to have it. In the case of Canada, changes to our constitution, the British North America Act, were left in the hands of England because the provinces and the federal government could not agree on a method for making changes or amendments in the future. So while we were politically and diplomatically independent from Britain, our constitution could only be changed by an act of the British Parliament. This is how the situation remained until the Constitution Act of 1982 brought the Canadian constitution to Canada, including, finally, an Amending Formula.